St Croix scuba diving is some of the best in the entire Caribbean. 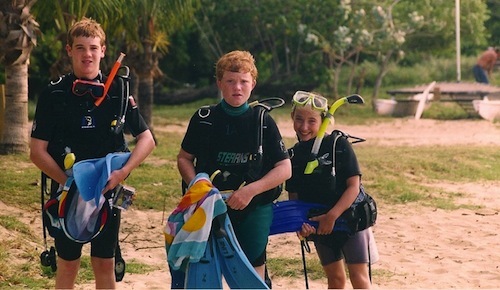 We've gone scuba diving in St Croix many times and it's always a thrill! St Croix diving is one of my family's favorite island activities. There are many beautiful diving cays and coves, filled with lush plants and tons of colorful fish. In fact, there are more than 50 St Croix diving sites to choose from! The most famous St Croix scuba diving site is called "the wall" at Cane Bay. A drop-off that goes from 40 to 3,200 ft! The wall includes both vertical and slow sloping areas, all teaming with tropical fish and incredible sea life. The most amazing St Croix scuba diving experience I've ever had was when I went night diving along the Cane Bay Wall with my brother! It's a sight I will never forget. I felt like I was peaking in on a whole other world! If you're interested in scuba diving at the Cane Bay Wall, or just scuba diving in general, I highly recommend the Cane Bay Dive Shop. 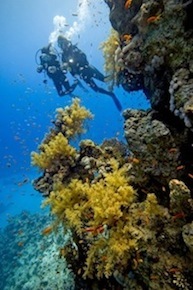 They offer many different options for dives and have some of the most experienced instructors on the island. And you don't need prior diving experience because they offer introductory courses and will guide you through the whole process. Cane Bay Dive Shop also has plenty of snorkeling equipment if you are more interested in St Croix snorkeling than scuba diving. While Cane Bay is my family's number one favorite spot to dive, we like to switch it up now and again because there are so many other great St Croix diving sites to choose from! Our second favorite St Croix scuba diving location. Salt River Bay is a National Historical Park and Ecological Preserve. It preserves some of the largest remaining mangrove forests in the Virgin Islands, as well as coral reefs and a submarine canyon. Salt River Bay is home to tons of beautiful fish and interesting sea life. We have seen huge sea turtles while scuba diving in Salt River Bay multiple times! There is a Salt River Marina that provides scuba diving tours and equipment and they are also very qualified and experienced. Last (but not least!) 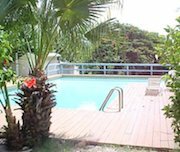 Frederiksted is also a great place for St Croix diving. Frederiksted pier is teaming with vibrant coral and colorful sea life. The pier is a great place for both diving and snorkeling. 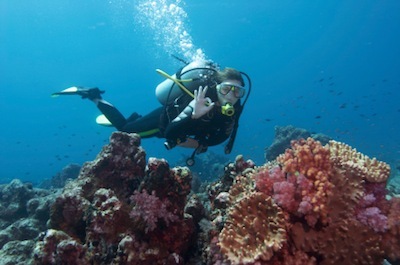 If scuba diving is a passion of yours, here's a great resource that offers information on other top spots to scuba dive around the world: Scuba Diving Place - your resource for scuba diving information.